BERLIN - Kevin Dunn took the snap, slid up in the pocket and to his left and saw Alex Halkias running down the field. It was toward the end of the first quarter of Monday night’s Class M semifinal against Sheehan and Berlin’s senior quarterback liked the matchup and liked the coverage. The ball went deep. It hit Halkias in stride for a 43-yard gain. Two plays later, Dunn found Halkias again for a 4-yard touchdown pass, running over to his tailback to congratulate him, and then briefly headed back to the sidelines. “It’s really easy with the weapons I have,” Dunn said. The way the Berlin football team looks at it, it has one of the most effective and efficient quarterbacks in the state. Dunn can throw from the pocket, on the run - accurate in both scenarios - throw deep, short and intermediate routes. The Redcoats also believe they might have one of the most underrated signal callers in Connecticut. 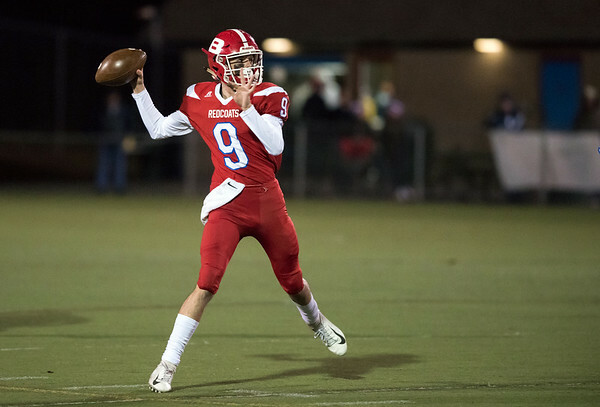 During his time as Berlin’s quarterback, Dunn has compiled a 20-4 record, led the Redcoats to back-to-back Class M semifinal appearances and their first championship game appearance since 2014. Berlin will take on St. Joseph for the Class M title Saturday morning at Shelton High School. He’s also set records and then reset them. Dunn broke the Redcoats’ single-season passing mark his junior season after throwing for 1,824 yards. He completed 64 percent of this passes that year to go along with 19 touchdowns and 13 interceptions. This season, Dunn beat his old passing record with 2,053 yards, still with one game left to play, while completing 62 percent of his throws, increased his touchdown total by eight to 27 and decreased his picks by 11 to only two. He’s also rushed for 250 yards (7.1 yards per carry) and three scores. Leading up to the state championship game, Dunn has thrown two or more touchdowns eight times this year, including Monday night when he threw for 257 yards and four touchdowns to go along with a 15-yard rushing score. That’s also part of the reason Berlin’s offense has been as effective as it has, averaging 36.3 points per game. Six different players have caught at least 10 passes and two touchdowns this season, with three of them totaling at least 23 catches, 400 yards and five touchdowns. Larry St. Pierre (24 catches, 503 yards, 7 touchdowns), Halkias (23 catches, 481 yards, 5 scores), Giancarlo Tufano (27 catches, 472 yards, 7 touchdowns), Zach Hrubiec (20 catches, 267 yards, 4 touchdowns), Andrew Brochu (16 catches, 188 yards, 2 touchdowns) and Marco Scarano (10 catches, 144 yards, 2 touchdowns) have benefited with Dunn under center. And the Redcoats will need Dunn to play well if they want to win their first state title since 2009. Then again, Berlin has seen it all season long. Posted in The Bristol Press, General Sports on Wednesday, 5 December 2018 21:18. Updated: Friday, 7 December 2018 21:22.